what will the weather be like in 2015? Modern weather forecasters may hesitate to make predictions covering more than a week or two at a time – but experts in medieval England, and across Western Europe, believed that forecasts for all of the coming year could be made by observing natural phenomena over the Twelve Days of Christmas. The instructions for doing this, known to historians as ‘prognostics’, were carefully copied into prayer books and service books for use by members of the clergy. This was not magic, but an extension of religious belief. The Bible made it clear that God sent signs to those who knew how to interpret them, and rainbows, strange clouds, and tempests could all fall into this category. Clearly though, not every rainbow or every cloud was an indication of coming events. Even highly-skilled interpreters of the Bible could find it difficult to judge on such issues; and it was still more difficult to decipher the actual meaning of a sign, once one had been identified. It was accepted, following classical theory, that comets always portended political upheavals (though deciding where these upheavals were going to take place was more tricky). But phenomena like winds and clouds were much less clearcut. This is where the timing of the potential sign was helpful – or even crucial. Certain times of the year had special significance; and the Twelve Days of Christmas were foremost amongst these. This was a time outside of ordinary time, when normal activities were suspended as much as possible. It was ushered in during the long night between Christmas Eve and Christmas Day, and concluded in January with Epiphany. The significance of this time was such that phenomena like strong winds, thunder storms, or bursts of sunshine, were accepted as carrying meanings which they did not ordinarily have. 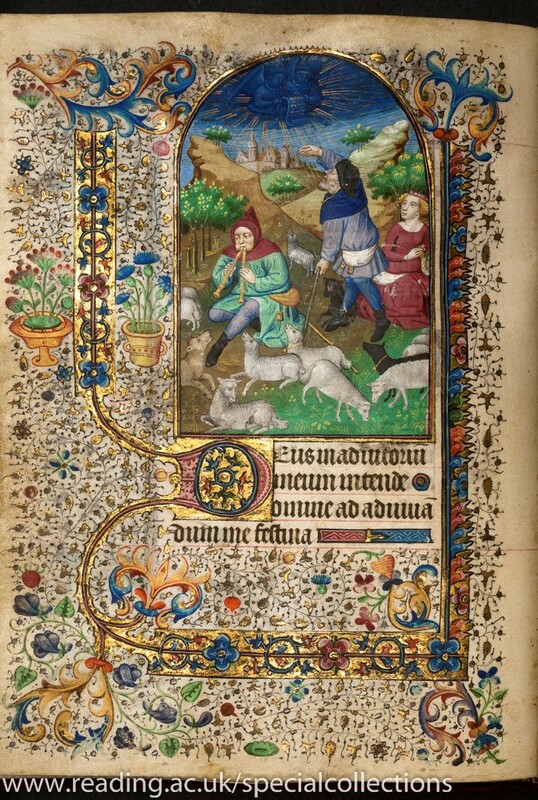 The first ‘sign’ of the arrival of Christmas was the appearance of the angels to the shepherds watching their flocks, as depicted above. 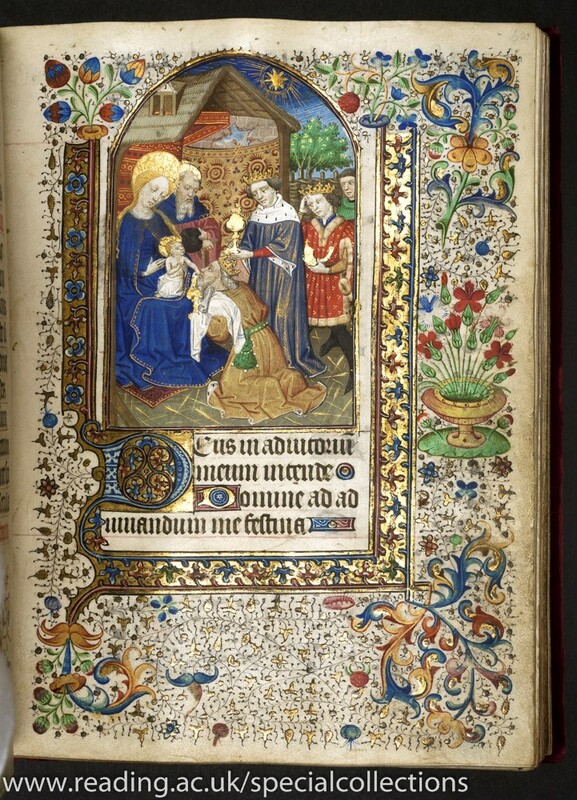 (Reading UL Ms 2087, image copyright University of Reading Special Collections Services) The other great ‘sign’ of Christmas however, the star which appeared to the Magi, needed astrological and astronomical expertise to interpret. For obvious reasons it was definitely not a comet; but its meaning and location were, as the Gospels showed, successfully decoded by only a tiny handful of specialists, whose high status is shown below. But what kinds of signs might appear during a modern Twelfthtide, between Christmas and Epiphany, and what would they mean? The key things to look out for are strong winds, periods of bright sunshine, and thunderstorms. Each of these is significant, but its meaning will depend on the day on which it happens. What follows is a consolidated list, based on medieval texts in Latin and English, and ranging from the 11th to the 14th centuries. Strong winds on this day mean that it will be a bad year for the rich and powerful; whilst sunshine signifies that the year will be happy and fortunate for everyone. A thunderstorm on any day in late December means that the year to come will be healthy, will produce good crops and lead to increased wealth, and that the Spring will be especially fine. The timing of the thunder is also key: the prediction is best of all if the thunder is heard in the early afternoon; mid-afternoon is a good sign for the crops; but thunder at the end of the day forecasts storms and tempests. Wind on this day forecasts a bad year for fruit trees and for vines; but sunshine means that gold and treasure will be found. For thunder see above. Wind means a very good year for cereal crops; and sunshine forecasts increasing prosperity, especially for the poor. 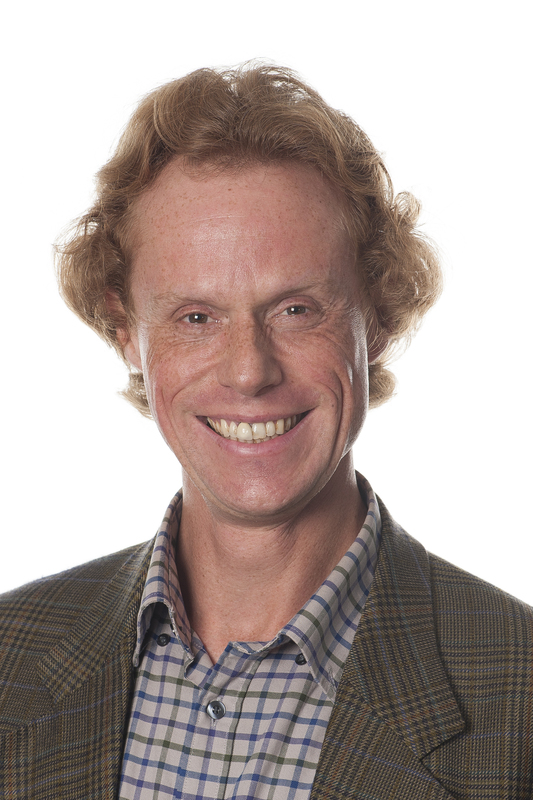 Strong winds mean a bad year for cereal crops; and sunshine predicts that hidden wealth will be discovered. Strong winds mean that this will be a bad year for storms at sea (and a risky one for engineers); sunshine forecasts an abundance of flowers and fruit. Winds are especially worrying on this day, since they predict political disruptions and scandals as well as unhealthy conditions. Sunshine means that this will be a good year for cattle and dairy produce. Storms and winds mean a high risk of fires in the first half of the year, but things will improve later. Sunshine means that conditions will be good for trees. Thunder at the end of New Year’s Eve is a very bad sign; but thunder at the start of New Year’s Day signifies that there will be good news. Winds foretell unhealthy conditions for the elderly; while sunshine means that mercury will be important in the coming year. Thunder is a forecast of severe winds, and damage to woods and orchards; but field crops may do well, especially if the thunderstorm takes place in the afternoon. Strong wind means storms, with damage to trees and property; but sunshine predicts a very good year for birds. Thunder is as above. Wind now means damaging storms to come; but sunshine predicts a good and prosperous year. Thunder is as on New Year’s Day. It would be best to stay indoors and not to watch the weather, since wind, sun and thunder all predict dire events. It is a little safer to venture outdoors now, since wind predicts bad political news and thunder signifies destructive storms – but sunshine only warns of a year of hard work. This is also the time to indulge in a major celebration before returning to ordinary life and all that hard work. Coming next, for those who would rather party in medieval style than watch the weather, are suggestions for appropriate entertainments for your twelve days of celebration…. It might be argued that our modern Christmas traditions are the result of an accidental cocktail of Christianity, pagan festival, the monarchy, Coca Cola and an invention by John Logie Baird. But many that we know and love today originate in the C19th with Queen Victoria & Prince Albert and their own family celebrations. Some modern traditions reflect progress in technology. 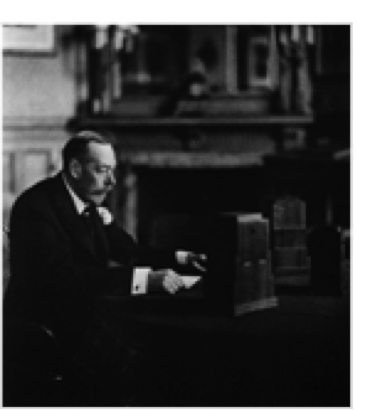 George V delivered the first Christmas radio broadcast from a makeshift studio in Sandringham, and connected to the Commonwealth via Norfolk’s Post Office land line in 1932. Sir John Reith (Director General of the BBC) used the Christmas broadcast as a key feature to inaugurate the Empire Service (now BBC World Service). The King’s first Christmas speech was written by Rudyard Kipling and reflected the King’s concerns for the Empire while projecting the human and increasingly accessible face of the royal family. But I digress; these are C20th concerns. I was privileged to spend three years working in the Royal Household at Windsor and experienced first-hand how strongly Christmas traditions continue to be observed. In keeping with tradition, the Queen presents gifts to her household in person, in her private apartments, with staff passing closely by the family Christmas tree. She also distributes an annual Christmas pudding. Gifts to staff often reflect family events from the year. In return, staff gather below the private apartments and sing traditional carols before the family remove to Sandringham for the holiday. While these activities may have a rather different feel today, their roots are solidly anchored with the Queen’s great, great grandparents. The sources of many British Christmas traditions have, at heart, Queen Victoria and Prince Albert and are largely German in origin. 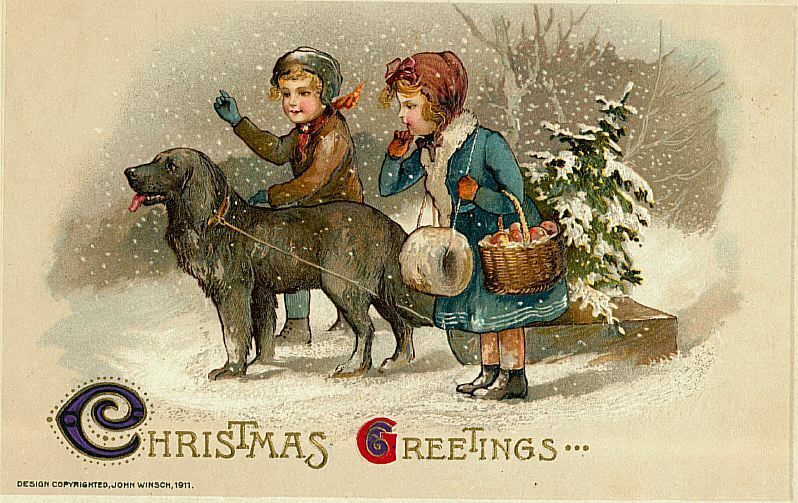 Before the Victorian period Christmas lacked the sentiment associated with modern Christmas. The 25th and 26th December were working days like any other. 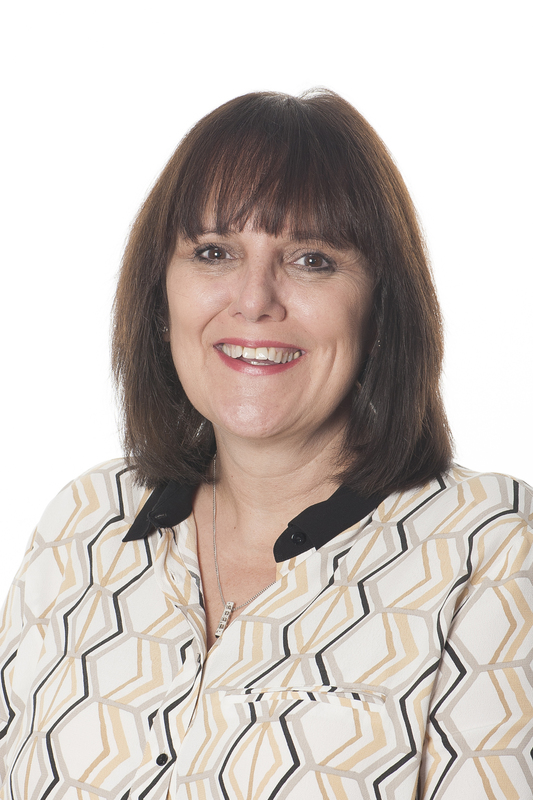 Industrialisation brought with it the growth of a newly prosperous middle class who increasingly had the means to take time to celebrate over Christmas Day and Boxing Day. 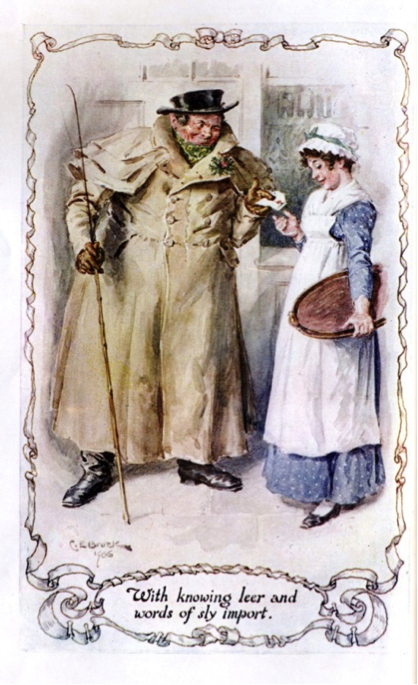 Christmas Day was traditionally concerned with the distribution of wealth to the poor; Boxing Day was the day that servants and working people opened parcels or boxes containing money that had been given by their masters or the ‘rich folk’ – although for female servants, accepting a few extra pennies, was not without its perils! The Queen and the royal family influenced fashion and set the trends that the emergent middle class adopted with relish. Their influence on society can be clearly seen in the adoption of Christmas traditions. Christmas was an ideal time for low level royal propaganda and details of family Christmases appeared in the press. 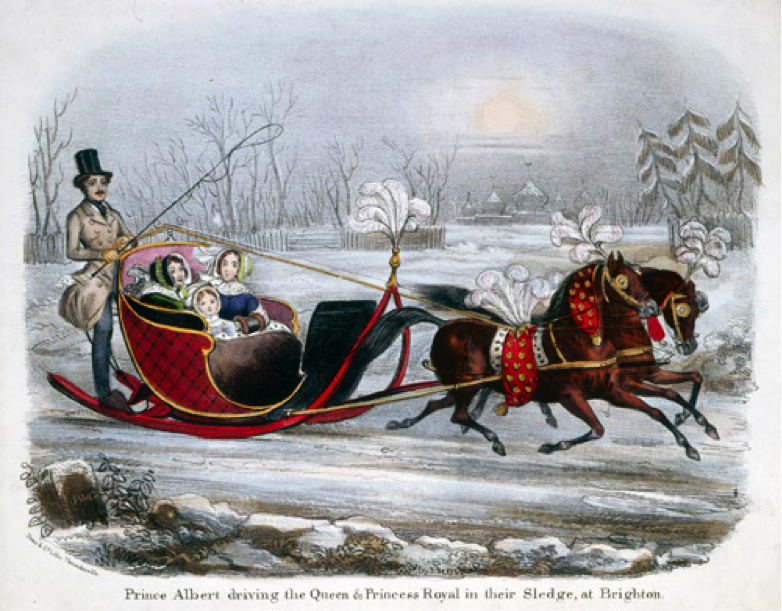 Queen Victoria’s own writing included descriptions of a happy family Christmas and everyday activities designed to promote empathy with the public. The Queen’s journals included carefully edited snippets of royal family life and Our Life in the Highlands provided a discreet peek into the everyday activities in the life of the Royal family. 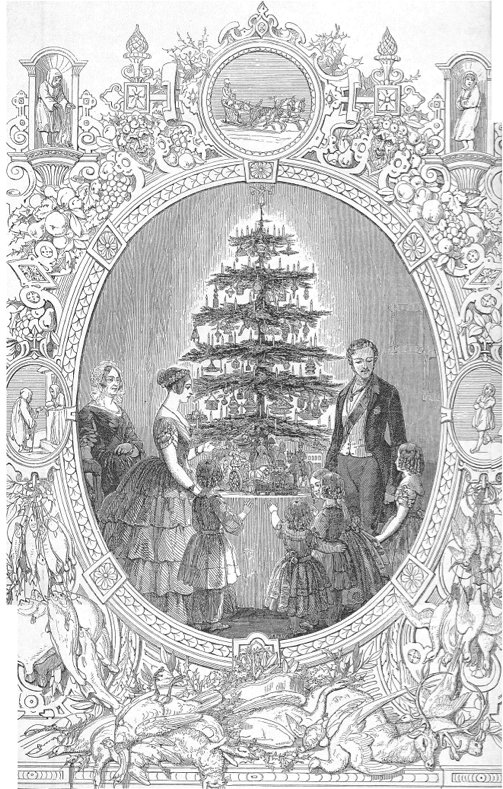 But the most enduring Christmas tradition was first described in The Illustrated London News Christmas Supplement and it inspired a fashion for buying and decorating Christmas trees. There are many versions of the image but the original appeared in a short article in The News in 1848. While Prince Albert is credited for popularising the Christmas tree, they had been a more discreet feature of royal life for generations. Queen Victoria’s German mother and grandmother had both brought trees indoors. Queen Charlotte preferred yew trees and dressed the branches with presents in the room of her attendant, Madame Berkendorff. 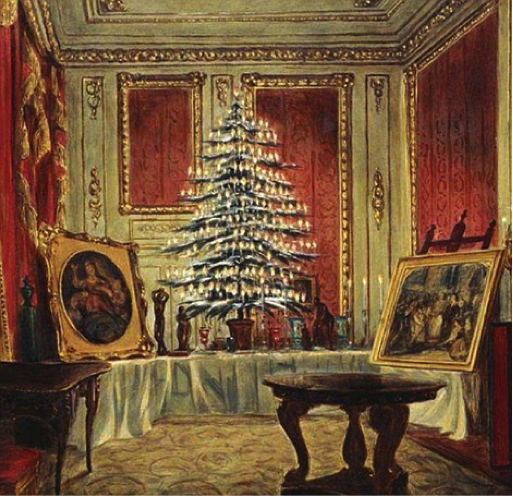 However Albert’s tree, imported annually from his ancestral home of Coburg, Bavaria, and pictures of dressed trees in the printed press set a trend that was new to the public. Albert also sent decorated trees to local schools and army barracks in Windsor. In a continuation of the tradition the current Queen gifts Christmas trees to worthy public institutions including Westminster Abbey, St Paul’s Cathedral, St Giles’s Cathedral in Edinburgh, Wellington Barracks and the Royal Hospital in Chelsea. The Illustrated News article fails to mention that the largest tree was often hung from the ceiling with smaller trees sitting on tables at the side of the room. In 2011 the Royal Collection recreated Victoria and Albert’s Christmas at Windsor. A giant conifer was hung in the Octagon Dining Room replacing the usual chandelier. 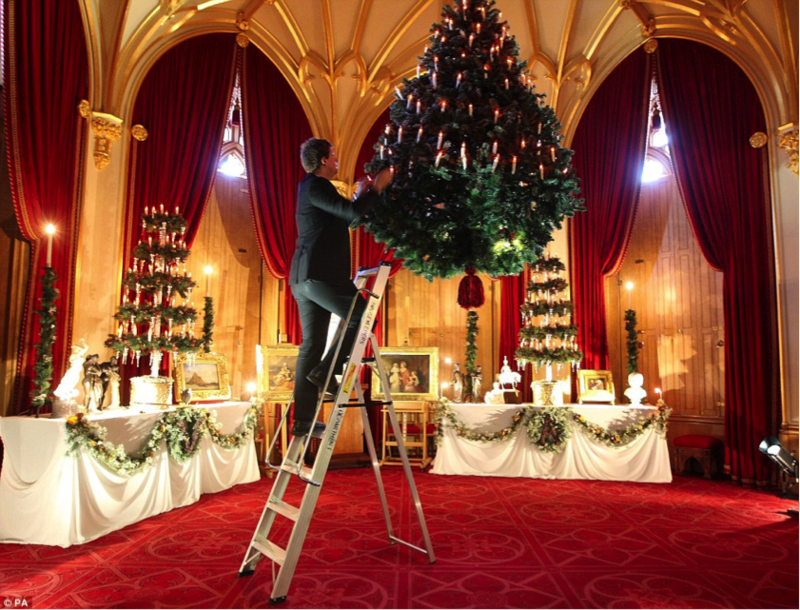 There is no recorded reason why Albert had the tree hung from the ceiling but a visitor to Windsor Castle in 1860 described how rooms ‘were lighted up with Christmas trees hung from the ceiling, the chandeliers being taken down. These trees…were covered with bonbons and little wax coloured lights.’ Today, as most of us cannot hang a tree from our ceiling, Albert’s supplementary versions must suffice, however we still put gifts underneath the tree. ‘My beloved Albert first took me to my tree and table, covered by such numberless gifts, really too much.’ In the German tradition, Queen Victoria and Prince Albert exchanged gifts on Christmas Eve; she continues ‘the 7 children were then taken to their tree, jumping and shouting with joy over their toys and other presents: the boys could think of nothing but the sword we had given them and Bertie some of the armour, which however he complained, pinched him’. Gifts were generally homemade or consisted of mementoes of royal children alongside the sweets and treats described in The News article. Christmas stockings for children were popularised around 1870 by which time industrialisation and mass production made toys and trinkets more affordable to the middle classes; although the poor may only have found an apple, orange and a few nuts in a stocking. Throughout the C19th a spate of our best loved Christmas carols were written and could be heard being sung communally both in church and in the street. Carol singers or ‘The Waits’ went from house to house collecting money – often long after public houses were closed! However one of the few royal traditions introduced by Albert that has singularly failed to catch on is the old German practice of Heiligabend Bescherung, the giving and receiving of presents on Christmas Eve that is still practised by many of our European neighbours. For Victorians and for us, one thing that has never changed – the cost of Christmas. As for me, I will dress my tree this weekend, in time honoured tradition, with fond memories of my Christmases at Windsor. I will also be very glad that I am not Elizabeth II who about now will be organising more than 40,000 Christmas cards. a) When was the first TV broadcast of the Christmas message? b) In what year was ‘Away in a Manger’ first heard? c) Where was the Christmas cracker invented? d) Who gifts the Christmas tree erected in Trafalgar Square? f) When did Dickens publish A Christmas Carol? g) What advertising image did Haddon Sundblom design in 1931? h) On what date is St Nicholas’ Day traditionally celebrated? Answers: a) The first televised message was broadcast live in 1957. b)1883, c) The confectioner Tom Smith of London in 1846, d) First erected in 1947 a gift from Oslo, Norway to the Royal Navy, e) Edward VIII in 1936, f) December 19th 1843, g) Sundblom painted the eponymous jolly Santa dressed in red for the Coca Cola Company, h) 6th December. 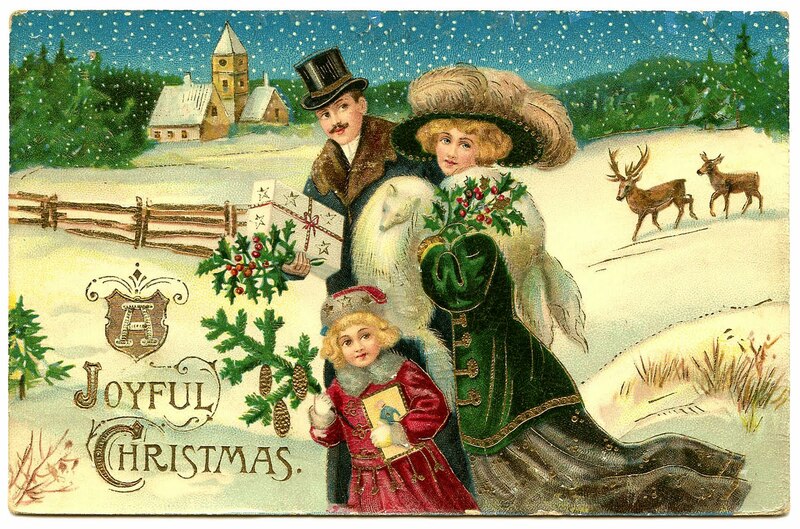 The Victorians excelled at inventing traditions, and none has proved as enduring as that of the traditional Christmas. In terms of what Christmas is – and leaving aside for the moment what it might mean – we could even date the ‘invention’ more narrowly to the 1840s. 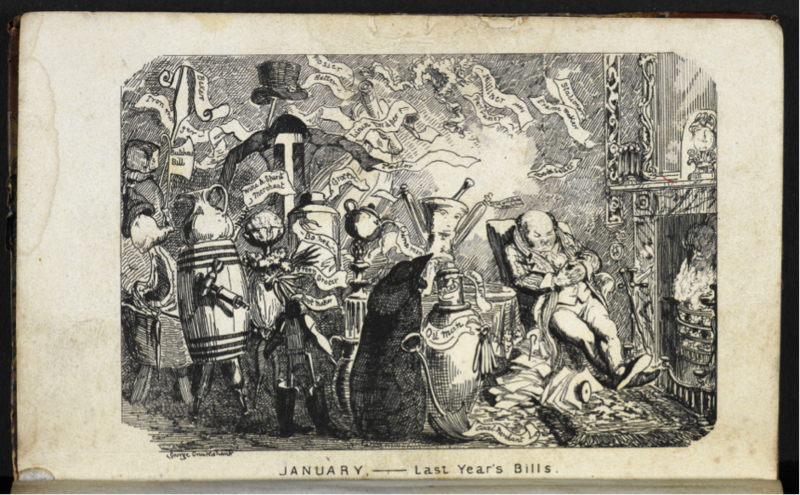 That extraordinary decade saw the first Christmas cards, popularised Christmas trees, and bequeathed the dubious delights of Christmas crackers. It also saw the publication of a morality tale which, in some respects, has supplanted the Christmas message of a child’s birth with the story of an old man’s redemption. Familiarity, however, has bred a superficial reading of the text: the comfort of returning annually to Dickens’s masterpiece has blunted the incisiveness of his message. 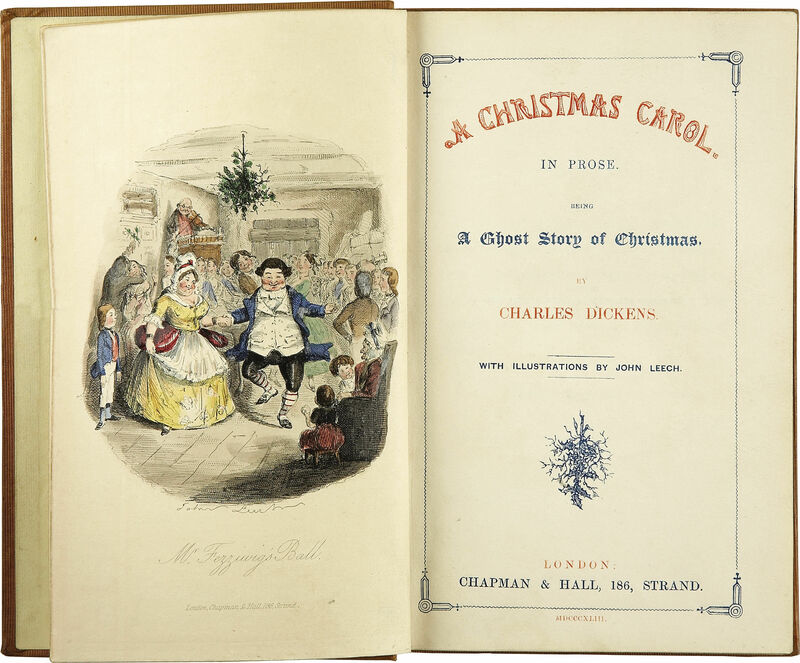 It has become all too easy to forget that A Christmas Carol is a deeply political book written in the midst of social turmoil by an author with a passionate, if somewhat idiosyncratic, sense of social justice. 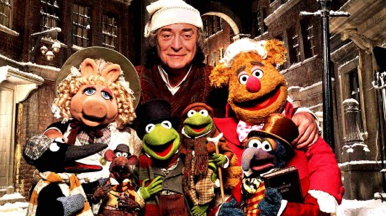 One notable feature of A Christmas Carol is its predominantly secular character. Despite the connotations of its title, the obviously Christian content is slight compared to Christina Rossetti’s later poem of the same name (which spawned the hymn In the Bleak Midwinter). 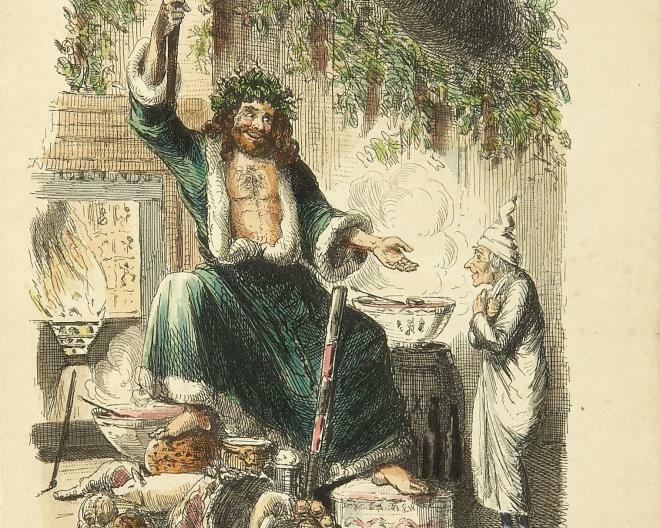 Rather than Christianity, the three hauntings drew upon Dickens’s interest in the occult and in the case of the ‘Ghost of Christmas Present’, a pagan imagery of Yule plentitude and feasting, while organised religion felt the lash of Dickens’s caustic wit. Dickens’s main target, however, was Malthusian political economy. Thomas Malthus’s population principle stated that poverty was a product of overpopulation. Worse still, giving aid to the poor only encouraged them to breed. Thus when the charity collectors visit his office at the start of the book Scrooge replies that the poor had better die and reduce the ‘surplus population’. 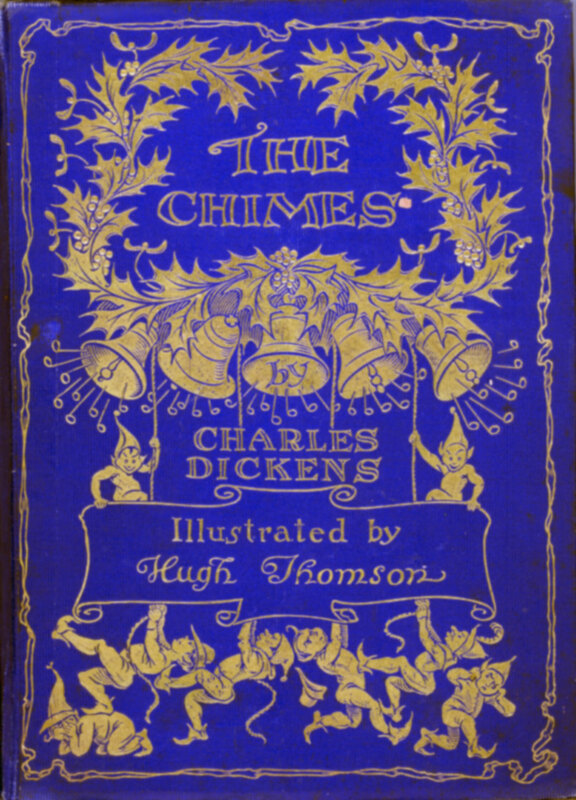 Dickens was to extend this anti-Malthusian theme in an even more direct fashion in his follow-up Christmas book, the now rarely read, The Chimes. Both stories were contributions to ‘the condition of England question’. This phrase – coined by Dickens’s friend and mentor Thomas Carlyle – was shorthand for the interrelated debates surrounding questions of class, industrialisation, poverty, and social responsibility that gripped the public mind of the mid-1840s. Most immediately it represented an anguished response to Chartism, the movement for political reform that gave expression to the suffering of the new industrial working class. Their radicalism was limited to exploiting the gap between the bourgeois ideal of Christmas and the reality of working men and women’s lives. 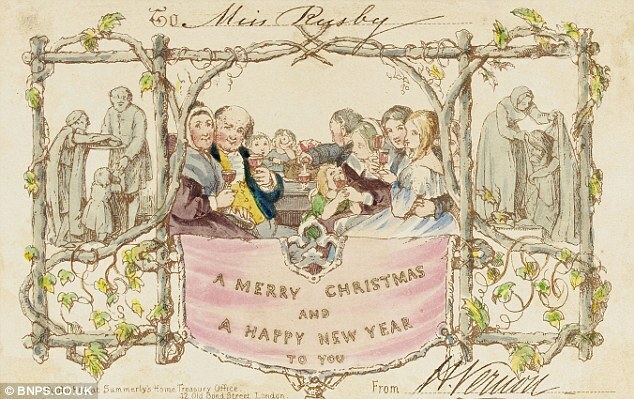 The first Christmas card, designed by John Callcott Horsley in 1843. Nowhere was this disjuncture between ideal and reality greater than in the Victorian workhouse. And as the immediate hardships of early industrialisation faded, and Chartism retreated, the workhouse came increasingly to stand as a rebuke to complacent images of Christmas contentment. The introduction of the New Poor Law in 1834 ended the tradition of the poor receiving extra food at Christmas. Poor relief was organised around the principles of ‘indoor relief’ (one must enter the workhouse to receive aid); ‘less eligibility’ (conditions inside the workhouse had to be worse than those outside); and the Malthusian precept that the sexes, including married couples, should be segregated. This was hardly a recipe for Christmas cheer, and the Poor Law Commissioners decreed that no extra food was to be allowed on Christmas Day. Over the years the rule against extra food was eased, provided it came from charitable donations, but the segregation of the sexes remained in force. 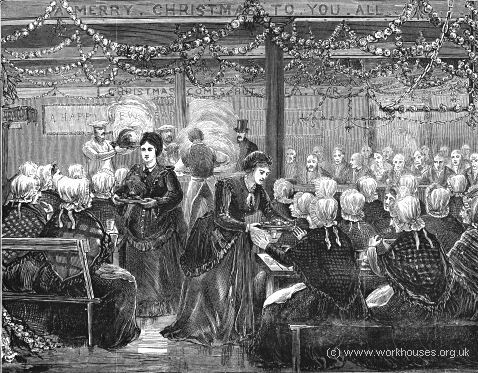 An 1874 illustration of Christmas ‘festivities’ in a Whitechapel workhouse. Just tell what you did for me, too. In some respects the recent furore surrounding the release of the BandAid30 single Do They Know It’s Christmas? 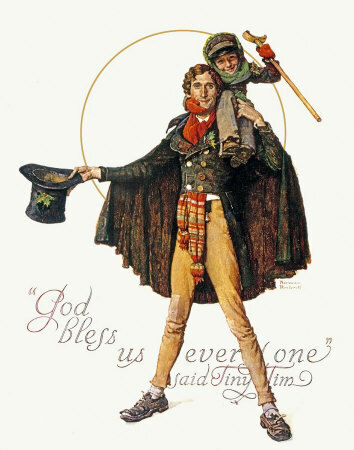 demonstrates that bristling against patronizing charity is a Victorian tradition that has endured almost as well as cards, trees, and those infernal crackers. Much of the modern imagery and symbolism of Christmas evokes the countryside. 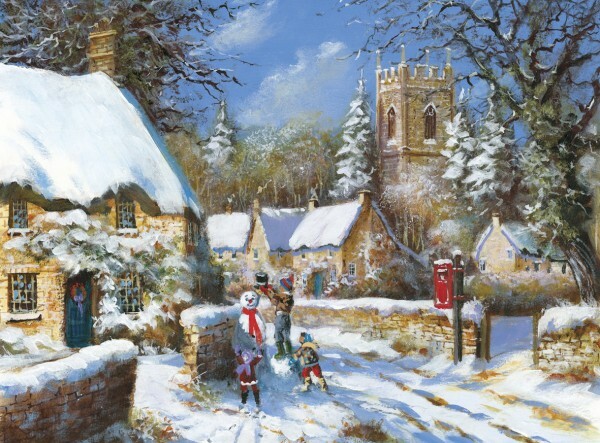 The card above references most of the familiar signifiers – snow, a thatched cottage, children playing, a country church, Father Christmas and a snowman. There is even an allusion to Christmas trees in the snow-covered conifers either side of the church tower. We decorate our houses with holly and ivy, sing carols about wassailing, woods, deer and frosty landscapes, and go on Boxing Day walks (or, in some cases, hunts). Much of this imagery is ‘traditional’, in the sense that it refers to a time gone by, or perhaps more accurately to a timeless historical continuity. It is not an accident that there are no cars in the Christmas card above – indeed there is nothing that carries urban or industrial connotations at all. But for the red postbox (an almost self-referential touch – perhaps this is the very postbox the card has been posted in?) there is little in the scene that conveys any sense of rupture with the medieval church tower. There was, however, one prominent, widespread, distinctive and significant Christmas tradition that genuinely arose ‘from below’, rather than being offered or imposed by the elite. This was ‘Mumming’ – a kind of stylized popular play with something in common with medieval mystery plays. Mumming took place mainly but not exclusively at Christmas time and, as might be expected with an authentic popular tradition, it had an economic context. Rather like the modern (and unrelated) Halloween custom of ‘trick or treat’, the immediate purpose of mumming was to extract money from more-or-less unwilling targets. Village mummers processed around the parish but typically confined their attention to the houses of the wealthier inhabitants. There was, therefore, an almost carnivalesque element of social inversion inherent in Mumming – for once, the working people were calling the shots and raking in the profits. All this made excellent economic sense in the dark, cold and all-to-often hungry days around Christmas. There were any number of variations on mumming but certain basic elements recur. There is almost always a hero, usually identified as St George, and his enemy (sometimes known as the Turkish Knight, sometimes as the Slasher). One of the two is killed but a third character, the Doctor, brings him back to life, a resurrection theme that one might think more appropriate to Easter. The photograph below shows the Alderley mummers (Cheshire), c.1910, with (from left to right) St George, the Slasher, the Doctor, the horse and jockey and a character known as the Enterer-in. For all its quixotic flavour, there was a subversive edge to mumming, which may partly explain its decline in the early twentieth century. Mummers sometimes covered or disguised their faces and there is probably a relationship between this and some of the forms taken by rural protest in the eighteenth and nineteenth century, from the infamous Waltham Blacks (eighteenth-century poachers) to the ‘Captain Swing’ protests of 1830 and the Rebecca Riots (South Wales anti-turnpike protests) of 1839-44. In all these cases, and many others, disguises including men dressing as women and covering their faces featured. Another feature that links mumming to protest is that one of the commonest forms of rural protest was marching round the parish calling on farmers, landowners and other employers and demanding money. In some ways the modern successor of mumming is carol-singing (although carols have their own distinctive history). As with so many other aspects of the rural past, the traditional country Christmas turns out to be far more complex, less respectable and more interesting than its sanitized present-day representation might lead us to believe. This entry was posted in Christmas Special and tagged 2015, christmas, Weather. Bookmark the permalink.